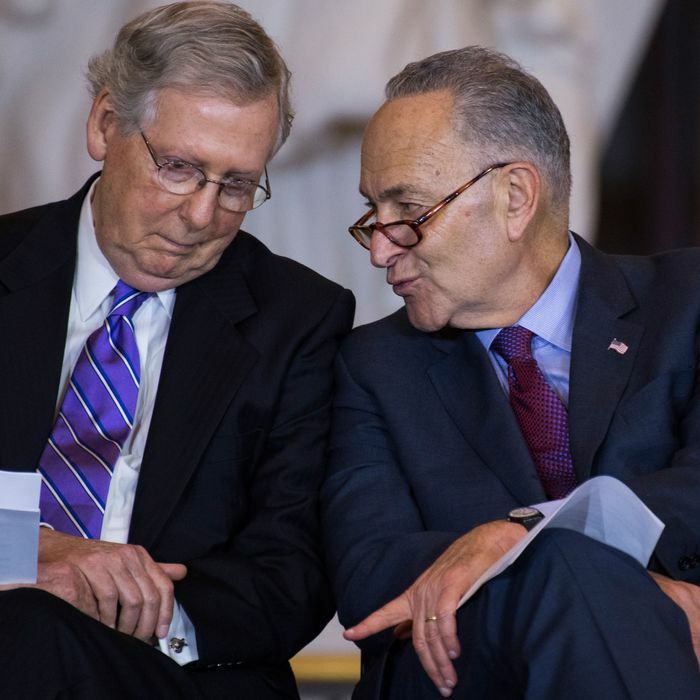 If they can get it past House Republicans, McConnell and Schumer will try to take a debt-limit increase off the table until after the midterms. Photo: Tom Williams/CQ-Roll Call,Inc. Congress’s latest and fifth stopgap spending bill in D.C.’s interminable game of “Will there be a(nother) shutdown?” brings with it some Kabuki-theater flair: Today, the House will pass a bill favored by conservatives that the Senate (needing 60 votes, including some Democrats) will take up and reject; a final bill will then be passed by the Senate and grudgingly accepted by the House. For now, everyone other than some House Democrats and Donald J. Trump (who issued a veto threat that nobody believed) seems fine with leaving the impossibly contentious immigration issue off the table until mañana. And with a back-scratching deal now in sight to smash spending caps on both defense and nondefense programs (the former demanded by the GOP, the latter by Democrats), a final bargain is now just a matter of time. But the negotiators appear to have hatched one big surprise: They are currently talking about sneaking an increase in the federal debt limit into the package that would keep Uncle Sam, Inc., solvent until after the midterm elections. This gambit could either make life easier for the rest of the year for Congress, or blow up the deal in the House. The federal government was expected to hit the statutory debt limit next month, even with all the tricks the U.S. Treasury can pull to keep the money flowing. Congressional Republicans have no one but themselves to blame for the accelerated timing, since it was largely caused by the revenue losses their precious 2017 tax-cut bill triggered. And there are all sorts of political peril associated with a debt-limit increase, particularly in the House, where many conservative Republicans have never voted for one in their entire careers. So it was beginning to worry congressional leaders that a debt-limit vote could get ensnared with the final, final, no-joke appropriations bill in March that the current stopgap measure is designed to set up. Unsurprisingly, now that the stopgap is looking like a safer bet, they’re hoping that they can toss the debt limit in there, too, at the last minute. But alarm bells are already going off in the House, where Freedom Caucus chairman Mark Meadows predicts that a bill that both busts the domestic spending caps and boosts the debt limit could cause as many as 100 Republicans to vote no. If true, that would mean that the final bill would require more than a few House Democratic votes. And that prospect grew a bit dimmer this morning when Nancy Pelosi announced her personal opposition to the emerging deal — not because of its spending or debt provisions, but because it offers no relief for Dreamers. So as the deal is finalized in the Senate, the real action will involve the counting of noses in the House. If Paul Ryan thinks he has the combination of Republican and Democratic votes in hand, then it’s a good bet that a debt-limit increase goes into the Senate bill. If it looks too shaky, the debt-limit measure will come out, and could still hang fire in March.